Our beautiful air-conditioned studio is the perfect training area for your team, where you can utilize our full-length mirrors, sprung hardwood floors, and sound system. Or, one of our trained staff members can come to you! Options listed can be individually designed to fit your team’s needs! Learn one of our overnight summer camp programs or have us create something brand new for your team! 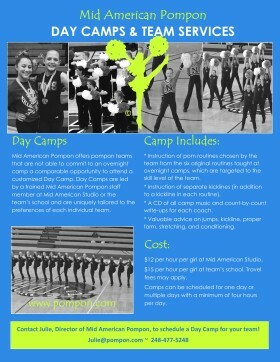 Both advanced or intermediate pompon programs available. Also includes: Warm-up & stretch instruction, pom/dance basics, & kickline instruction. Convenient and flexible scheduling for your team! Contact us for more information on day camps.